The above prayer talks about the mystery of Jesus’ birth but in reality the mystery surrounding Jesus’ birth isn’t his actual birth the mystery was his conception. “Mary asked the angel, “How can this happen? I am not married!” The angel answered, “The Holy Spirit will come down to you, and God’s power will come over you. So your child will be called the holy Son of God.” (Luke 1:34–35, CEV) The mystery surrounding Jesus’ birth was the implantation of the Divine Embryo in Jesus’ birth mother. The mystery of Jesus’ conception does not end with his birth because the Holy Spirit continues to come down on us, and God’s power continues to come over us. However rather than implanting a Divine Embryo in our hearts the Holy Spirit implants not only the birth Jesus but the resurrected Jesus as well. It is then the real mystery begins the mystery of love, the mystery of peace. The mystery of love is illustrated in the fact that while we were yet sinners Jesus made a hushed yet weighty entrance in our lives. The mystery of peace is illustrated in the calmness of Jesus’ life in spite of the tumultuous times of his birth. And there’s even a deeper mystery, not only is the love and peace of Jesus implanted in us but so is the purity of his birth and the life of his resurrection ours too. 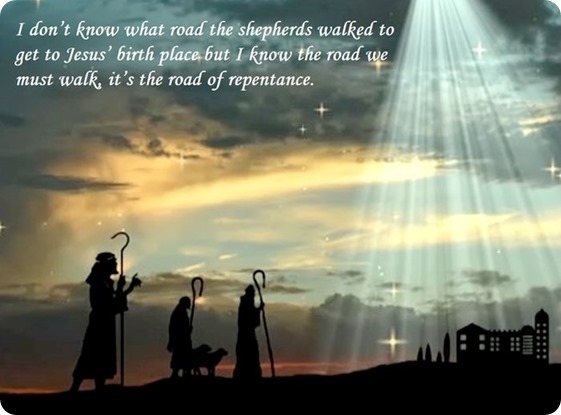 I don’t know what road the shepherds walked to get to Jesus’ birth place but I know the road we must walk, it’s the road of repentance. LORD, “Help me to feel renewed patience settle in my heart, and to lift my face in joy. I have been like a lost lamb, but I hear your voice calling me and I feel how deeply you want me to return. Somehow I know that you rejoice in my desire to find you.” Amen!